Nineteen readers love this post. Nothing says Fall like the smell of soft spices, the tastes of caramel, and the sights of warm colors with the trees changing from golden yellow to reddish brown. This cocktail is inspired by those changes... and tastes best when enjoyed outdoors in the cool crisp air, ideally by a fire! The warm spice notes in Michter's Rye is complimented with the bright orange flavor of Cointreau and bittersweet coffee notes of Kahlua. A touch of Fernet at the end adds complexity and balance. 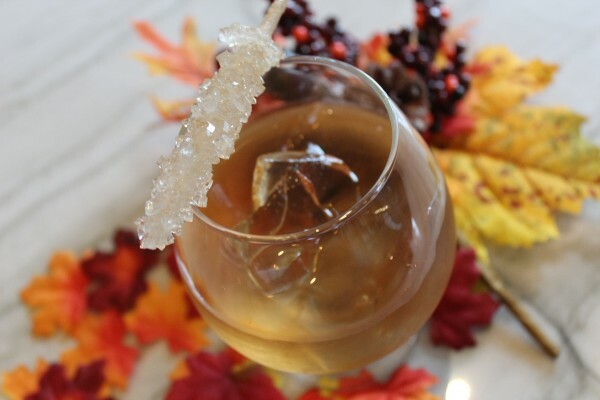 The maple rock candy garnish gives you an optional boost in sweetness, or a fun snack, with hints of rye, orange peel and caramel from the Maine Maple Syrup. Cheers!! - Stir all ingredients and strain over fresh ice into a snifter. - Flame Orange twist over the top and garnish with maple rock candy.